Winter 2014 Reveal Day 6 - New SN@P! Sets! I'm so excited to share with you 6 brand new SN@P! Sets! SN@P! Sets are simple - they're designed to coordinate with our SN@P! Binders, our SN@P! Albums & Pocket Pages. They make it super easy to put together a card, a layout, a pocket page - even an album - in a SN@P! Speaking of when you can buy them - we'll be shipping the SN@P! Sets to retailers mid March, so you'll have to wait just a bit to get your hands on these, but trust me, it will be worth it! Ok, I know what you're saying - enough words already! Get to the pictures. Okey dokey then, here goes! With this release of SN@P! Sets, we've introduced something new - Squares & Pieces - a fun mix of our Bits & Pieces die cuts and our new 2x2, 3x3 & 4x4 Insta Squares. Aren't they the cutest?! The squares are perfect for the new 6x8 Insta Pocket Pages I shared in this post earlier this week. Those cards just kill me - so stinkin' cute!! Of course, we couldn't neglect all of you feline lovers out there.... Please meet the companion to SN@P! Dog - SN@P! Cat! Next up - SN@P! Wedding. Hip, Hip Hooray - how about a little SN@P! Birthday today? And last, but certainly not least, how about SN@P! Summer? 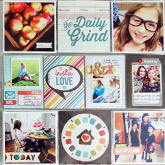 The new Squares & Pieces and the new 6x8 Pocket Pages make it so easy and fun to pit together an album it's as simple as cropping your photos with our new Photo Crops, then inserting them in the Pocket Pages along with the Squares & Pieces! So, what do you think? Which SN@P! Set is your favorite?! Remember, the new SN@P! Sets begin shipping to retailers mid March, so it won't be long before you'll have them in your hands! Now, how about a chance to win a SN@P! Set prize pack before you can buy it?!! You have 2 chances to win! Second - PIN TO WIN! Just pin your favorite of the SN@P! Sets images in this post, tag your pin with simplestories and snap sets, then leave us a comment on this blog post telling us that we've been pinned and include your Pinterest user name. That's 2 chances to win a DIY goodie box before you can buy it! And because I'm feeling extra generous, how about a 3rd chance?! If you're not a Simple Stories follower on Instagram, now might be a good time to start, I'm just sayin'! I'll be doing random giveaways on Instagram as well throughout the week, so follow us at simplestories_ for a 3rd chance to win! I'll announce all of the winners throughout the week in one giant celebratory post here on Friday the 17th, so make sure to check back then to see if you're one of the lucky winners! Good luck - we can't wait to hear what you think about our new SN@P! Sets! That wraps up our Winter 2014 Reveal Week my friends, thank you SO MUCH for joining us :) I'll be sharing some behinds the scenes photos starting tomorrow from the Craft & Hobby Association tradeshow. Loving Sn@p! Travel this would be perfect to scrap the holiday we had in September! Oh my goodness! These are SO cute. How fun are the new pieces and squares! Love it all, especially the sunny new Summer Sn@P! Oh my goodness! We met at archivers scrapfest. I was in your crop and you ask for suggestions and I said do a dog line and make it separate from the cats and you did it!!!! I am so happy!!!! thank you!!!!!! I can not wait to message my friend and tell her to check it out!!! These are all amazing but I have to say I love the I DO the most as I have a daughter getting married 10/10/15 and this is just her style! In fact, we are heading off to a Bridal Expo today! I love the Snap Summer so great for pics of our trip to the beach!!! I have a dog but I don't normally love dog products when it comes to scrapping - but I love this line of the Dog Snap line! It is super cute and I know that I would totally use it in my PL and my scrapbooking LO's! Love LOVE these. The summer and dog ones would be my first pick! The Dog set is definitely my favorites! I love the Summer set too. I pinned those fabulous Dog sets straight to my shopping list pinterest board. My username is becky_fischer. I really love the Travel set. I will be ordering everything in that set and everything that coordinates with it. I love these!! Have to have all 6!! I love them all! If I had to choose though I think I would go with the dog and cat collections to start off with. They are absolutely adorable! So fun! Love the pet sets- Can't think of all the times an everyday snapshot has been photo-bombed by a dog tail or a nosy kitty! Oh the dog set is adorable! The Snap Wedding is my favorite because it will match my wedding colors. The Travel set is not far behind though! So darn cute. I love and must have Summer and Travel. Love all the new collections you've been showing! Summer is adorable! Love the travel and summer in particular! Greater stuff! Snap Dog is amazing!! I scrap so many photos of my little dog so that would be perfect!!! Well, there isn't one of these that I couldn't use and love! If I had to pick just one, I'd say the Summer collection! Love the bright, happy colors! Holy cow! These are so awesome. I want them all! Love, love, love the summer set. A close second would be the birthday set. They are all great! The Travel line is perfect. I have last year's and I love it. It's all over my NYC travel journal from our weekend trip. I am Beth Lemon on Pinterest. Wow, they are all so beautiful and versatile! I love the wedding card set! These are so perfect for making handmade journaling cards! I can't wait to get my hands on them! Wow! I have a dog and I need a collection of SN@P! Dog. But I liked the other collections. My favorite is the Travel Line! I *need* birthday and summer!!! Amazing!! I see 4 sets that I absolutely must have, so I'll be finding them in mid March for sure - but the Snap! Dog set really has me squealling out loud! I have a new puppy and there isn't nearly enough out on the market for that topic at the moment... would love to get that set ASAP! Thanks for the chance to win ahead of stores! Loving all the snap sets! Super cute!! Love them all! Especially, the travel ,dog and summer! Loving the new snap sets - the dog set is going to be perfect in helping me get motivated to make a mini about our fur babies. beautiful!! !love the travel line is fantastic!!!! I love the summer set. So many fun colors and graphics. what fun new sets, there are 4 that I will be saving my pennies for! Oh I have several favorites among these! Top of the list is the Travel set. love the dog and travel!! Super cute! Loving the dogs! The Travel and Dog sets are my absolute favorites (the Travel set goes perfectly with the Urban Traveler collection!) and the Summer set is a close 3rd. It's hard to pick just one, they're all cute! Snap Summer looks very fun to use, nice bright colours. I totally love them all, and it's extremely difficult to pick just one. I'm going with the cat collection because they are the best cat themed scrapbook items I've seen in a very long time. But I also love the travel and summer. I will definitely own all 3! I've also pinned my 3 favs! Here's the link to my pinterest profile: http://www.pinterest.com/mndtiiu/ on the Pin it To Win It board! :) Thanks for this awesome chance! They're all cute, but I have a nephew getting married in June and the wedding kit would be super fun to use! I think the Snap Birthday set would make cute and easy cards! The Summer collection is my favorite though! The Dog set and the birthday set are wonderful (actually they all are lol) I can see several of these in my collection when they are released! I love it all...but particularly the travel sets. Snap Birthday is my favorite but Snap Dog is very cute too. Ah, Layle, I will NEVER tire of seeing your posts!!!! Don't have any animals, but the Birthday, Travel, and Summer sets are all on my must have lists!!! The bithday line makers me want to go to the shop NOW! But they just closed till monday. oh, patience... How hard dan it be!! I love the summer and birthday! Thanks for the chance to win! Love these new Snap sets especially the travel one! I love DIY! We are constantly checking out pinterest for new ideas. The releases look amazing! So many awesome cards! I love travel and summer sets most. I like so many i might need to get another job to support the hobbie LOL!!! My favorites for today are Travel, birthday and Summer. Thanks for the chance to win! So many great new Sn@p Sets...you did it again!!! I love both the dog and travel sets, but if I had to pick just one, the travel set would be my favorite. The dog set is just too cute as well! Thanks! I love the travel set! Love the Travel and Cat SNAPS !!!! Great stuff! LOVE the travel line and would love to work with Summer, Birthday and Cat as well. I always love your snap sets! LOVE LOVE LOVE! All these new collections - I going to break open my piggy bank - because I need them all! Love all the new collections!!! The colours in all of them are amazing. So adorable! I love it all, especially that cheerful travel stuff! Lots of fun in this post, but I really want the travel set! Love it! You've been pinned! I'm Michelle Bond on Pinterest! I am instagram stalker...I mean follower! LOL! I'm michellgb there. I Love that you offer Stickers, squares & pieces along with 3x4 and 6x4 cards - because you don't just want the cards, you also want to do a little embellishing. And you know those extra bits will be flat and the perfect size because they were designed for pocket pages! The pet collections are really cute (but I don't have any pets! ), and I love the travel set. Log the Snap Dog. Got a new puppy in August and I have been looking for new paper to make my mini album with. I love the pet & travel!!!! So awesome!! !